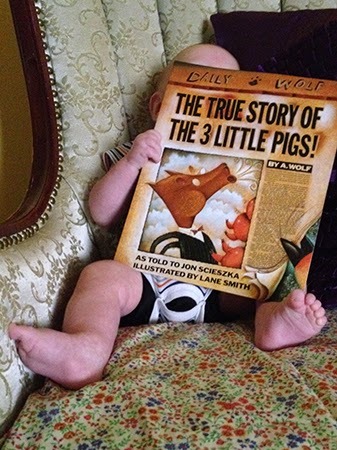 Forget everything you think you know about the three little pigs - this is the real story! Alexander T. Wolf (you can call him Al) is tired of everyone thinking he’s a big bad wolf just because he likes to eat cute animals. The truth is, he just needed to borrow a cup of sugar. And since he had a cold, he decided to just walk over to his neighbor’s house. It’s not his fault his sneezes demolish houses - who builds out of straw and sticks? Al went from merely borrowing a cup of sugar to being jailed for “huffing and puffing” - proof that reporters always skew the story! This book isn’t actually by Jon Scieszka, it’s by Alexander Wolf. And because this is his story, told from his point of view, he’s an unreliable narrator. He’s been know throughout history as the bad guy of the story, and even with justice insisting everyone is innocent until proven guilty, you’ll find A. Wolf a little hard to believe. Even so, the way he tells the story is very humorous and very childlike - making up reason after reason for why he did this, and then that, and how it got skewed. I think that is what makes it so appealing to children: the perfect combination of silliness and familiarity, told on their level. With a story told from the bad guy’s point of view, you can’t expect bright colors and smooth drawings! Lane Smith’s art fits The True Story of the 3 Little Pigs perfectly. The colors are mostly dark - maroons and burnt oranges, browns and tans. Each picture looks grainy, but on closer inspection, the marks are a lot of texture added to each drawing, like bumps on bricks, needles of hay, woodgrain on the chalkboard frame. The desaturated colors work well with the few samples of newsprint on the covers and at the end of the book. The illustrations seem a little dark for such a humorous story, but they are effective at setting the mood of an unreliable narrator trying to get you to believe his side of the story. I loved this book as a child, and was thrilled to discover it’s just as funny now! I read it to my son - he’s only three months old, but so far all the fairy tales I’ve read to him have been fractured fairy tales! As an added bonus, we got to meet Jon Scieszka August 20, 2014 - he’s just as witty in person as in writing. I think it’s fun to read fractured fairy tales and compare them with the originals. This book is especially fun because the wolf seems sympathetic, wanting to bake a cake for his granny! It’s interesting to see who kids side with, since most know the other story of the three little pigs, and are now faced with looking at it from the bad guy’s point of view. The True Story of the 3 Little Pigs is #35 on School Library Journal’s list “Top 100 Picture Books” of all time. In 2008, Scieszka was the first National Ambassador for Young People’s Literature, a position created to bring awareness to the importance of reading at a young age. He is also the founder of “Guys Read,” a nonprofit literacy organization. His book The Stinky Cheese Man won a Caldecott Honor medal. Lane Smith was the illustrator for that book, and has worked with Scieszka on The Time Warp Trio novels. Smith has collaborated with many other authors and won countless awards for his work, including the recent Caldecott honor Grandpa Green. The scope of activities for this book seem endless, because it’s so inviting for children. They can make up their own fractured fairy tales. They can discuss whether they believe the wolf or not, and explain their reasonings why. They can (and should!) read The Stinky Cheese Man and Other Fairly Stupid Tales, also by Scieszka and Smith, and discuss the fractured fairy tales told there. As an extended study, students can read more books by the author and illustrator separately, and compare and contrast their works.